Storage solutions—not the most enticing or exciting pair of words. In fact, the word storage conjures up feelings of sterile office spaces, tedious filing systems, and reorganising unkempt domestic spaces. However your home storage needn’t be a tiresome, nor a difficult task. Often when we talk about rearranging spaces, especially within one’s home, the immediate thought and feeling is of exhaustion. Remove your organisation rut, and implement some stylish repositories for all your domestic accessories and accoutrements. Check out the following outrageously luxurious and practical solutions for your home, and ensure you keep your abode looking polished, sleek and flawless. Similar to something out of a dream, this wonderfully designed walk-in dressing space is equipped with room for everything. 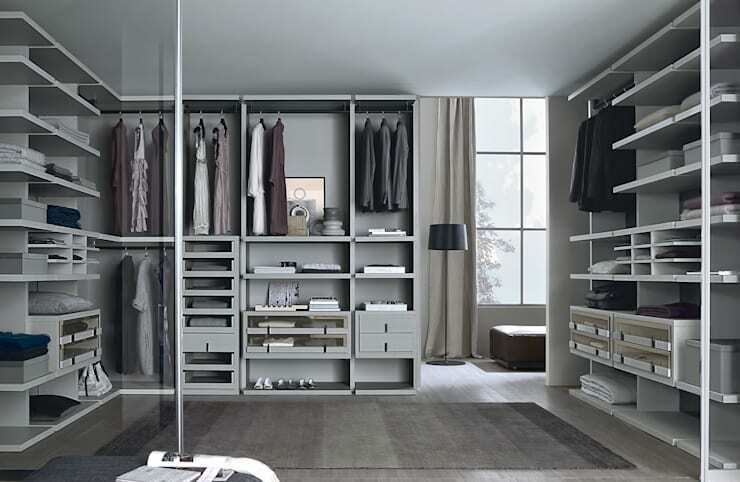 If you are lucky enough to have room for a dressing space, or walk-in robe, then ensure you kit it out with smart storage. One of the most important things to consider are the smaller compartments for your accoutrements. Think clever sectioned drawers for watches, jewellery, ties and other accessories. To finish the space, and ensure it is comfortable and warm, try carpeting the space, or implementing a plush rug that exudes luxury. Corridors are often tricky spaces, they see a high volume of foot traffic, and hold some of our important daily accessories and appurtenances. Shoes are often one of the biggest problems. When we come inside, we take off our shoes, and more often than not throw them into the corner of the corridor to put on again when we leave. This creates mess and ruins the aesthetic of our well-designed homes. 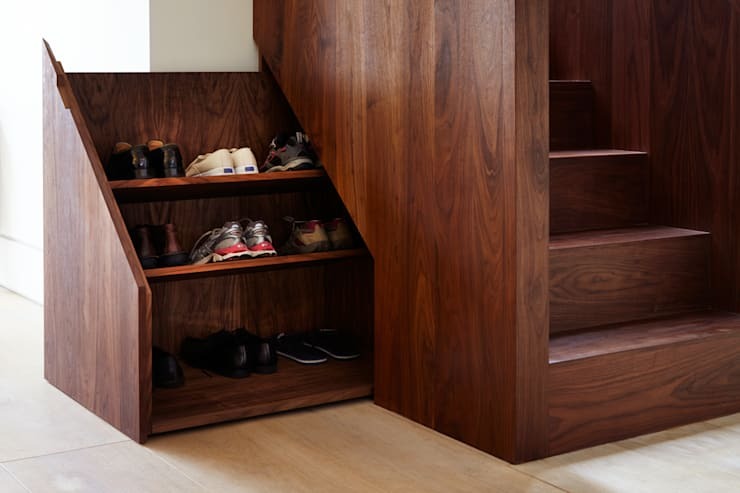 Take a look at this clever under-stair storage from Fraher Architects, the shoe shelf slides out easily and has a space for all of your footwear, keeping it out of the way, and reducing trip hazards and mess. A simple solution to kitchen storage are these stylish hanging hooks. Available in different colours and finishes, hanging hooks can work wonders in the kitchen. 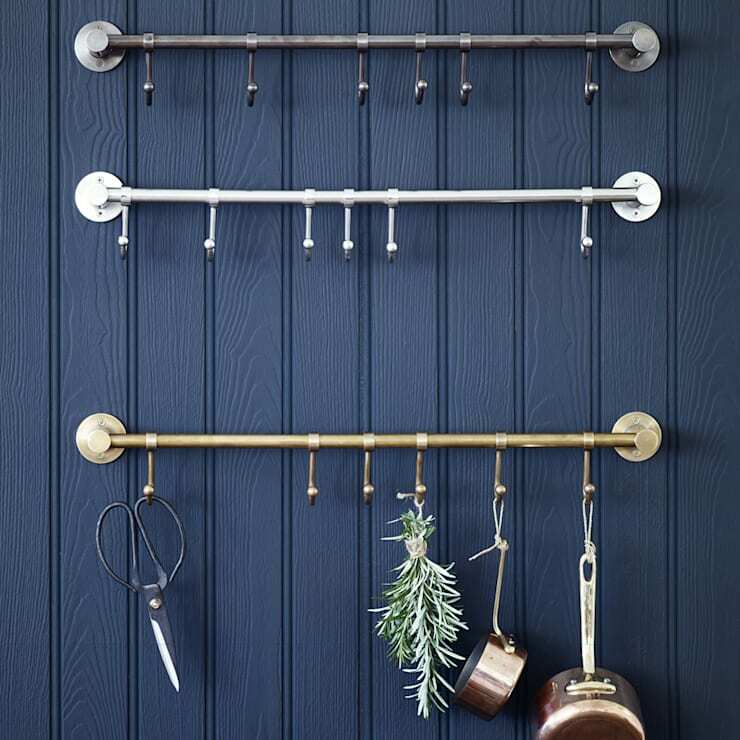 Hang pots, pans, utensils and even dried herbs, these hooks will ensure everything is in its right place, and within easy reach. Try supplementing cupboard storage and instead placing one or two of these hanging rails in your space. It will look like a stylish decoration while acting practically and efficiently. Storage can be hard to come by in a busy and full house. If your basement is packed to the brim, and your attic is chock-full, you can find extra space underneath the seating in your home. 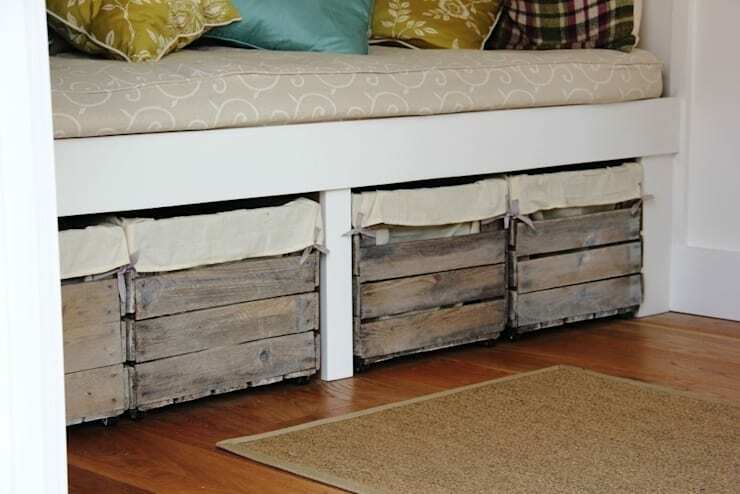 This example shows a rustic approach to under-seat storage that provides an attractive way to look after your goods while keeping the space neat and tidy. This design works for varying décor and designs, if your space is minimal, consider a box that is sleek and clean, as opposed to rustic and shabby-chic. 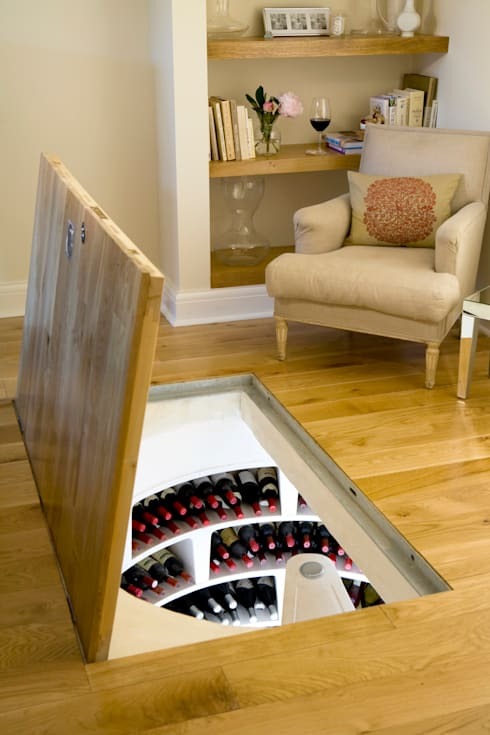 Looking for somewhere to safely store your wine collection? Take a peek at this amazingly stylish wine cellar that blends effortlessly into the surrounding décor. Open the trap-door and you see a spiral staircase leading down around the perfectly temperature controlled space, which is a brilliant way to display and store all of your wine. This cellar disappears once the door is closed, but if you want to make a statement, consider a glass door to enhance the essence of luxury, and ensure your wine collection is the centrepiece of the space. How many times have you walked barefoot across a rug, only to tread on a lonesome piece of Lego that feels as those you’ve stomped upon a jagged piece of glass? 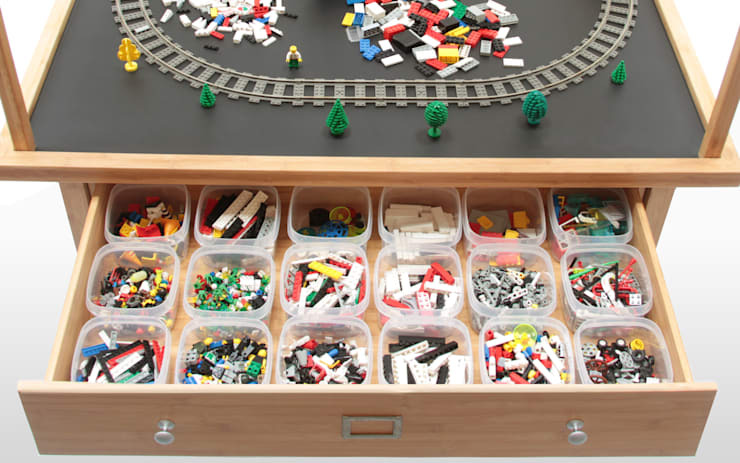 As you let out a blood-curdling yelp, and frantically try to avoid the other toys that haven’t been cleaned up, consider implementing a better storage system for your little one’s toys. This inexpensive system employs a series of containers that will ensure everything has its right place, and is off of the floor. Of course, you still need to convince the children to actually clean up their belongings, but once they do, there will be a stylish and easy place for everything to sit.